GoodTalk is “a Slack Bot that helps managers and employees have more productive meetings” in order to help get the most out of one-on-one exchanges. Slack is a great work tool for communication. Teams love being able to easily send messages to one another in real time and keeping conversations organized by channels. For speed, convenience and simplicity, Slack rocks. Is there a downside to being able to connect so efficiently? Well, employees and managers do grow accustomed to living with one another in their back pockets. When it comes time to have a more serious conversation, it’s not always obvious that more than the typical quick question/brief exchange is being called for. Setting up different channels for different kinds of conversation is one way to make the distinction, but there’s no guarantee that’s how they’ll actually be used. Is there a better way to signal when the stakes are higher? To make it clear when a request to talk is a call to go deeper into the nitty gritty of a subject? is “a Slack Bot that helps managers and employees have more productive meetings.” It’s intent is to help both parties get the most out of one-on-one exchanges. The way that GoodTalk achieves these objectives is by turning messages into meeting agendas. Messages serve as a convenient place to share questions before a meeting, to add notes and other questions, so that the actual conversations are substantive. 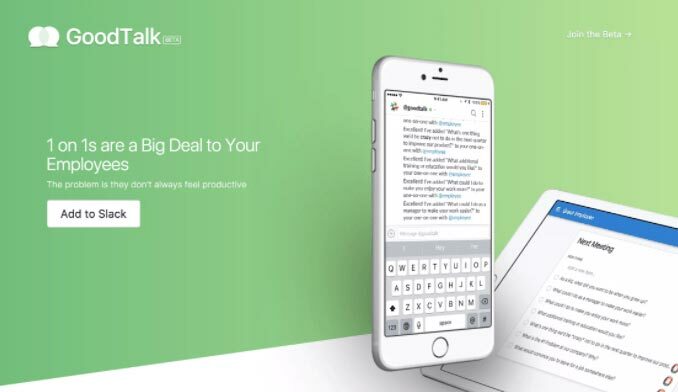 GoodTalk allows people to prepare for a meeting. Without much ado, it’s a simple tool for letting each other know what they’re getting into before a conversation, and a practical means to avoid any ambiguity – to not catch anyone off guard when the expectation is talk seriously. No one enjoys that feeling, or the awkward silences it can create. Turning the message space into a place for a more meaningful exchange also aims to build stronger relationships. By soliciting employee questions and feedback, managers can make their appreciation for employees more apparent, which, of course, helps employees to feel valued. GoodTalk goes another step further to support managers by supplying curated questions and best practices, meant to help them prepare in less time and to interact with their employees more effectively. On the follow-up side of conversations, GoodTalk sends call-to-action notifications so that matters discussed don’t fall by the wayside. Looking to add value to your Slack communication? To develop trust, consistency, productivity? While in the beta phase, GoodTalk is free to use. Add the bot to your Slack or learn more about what it has to offer by visiting the company website here.